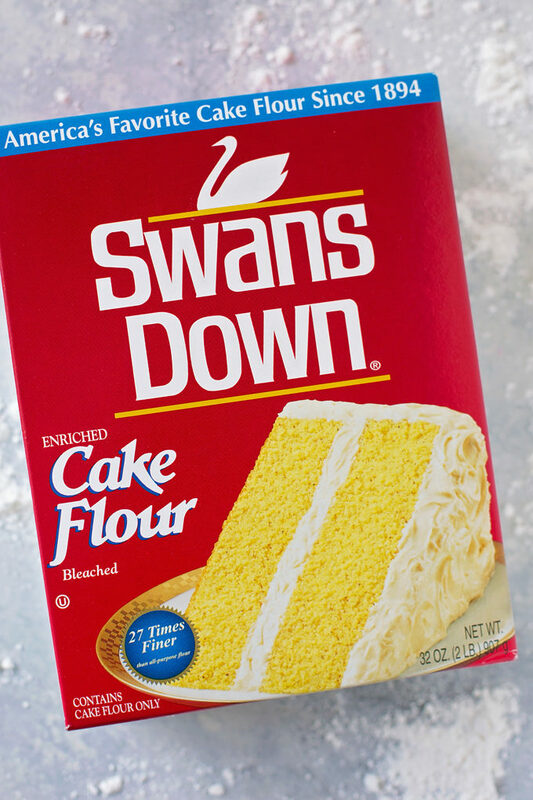 I’m partnering with Swan’s Down® Cake Flour to bring you today’s recipe. All opinions are my own. Thank you for helping me work with companies I love! 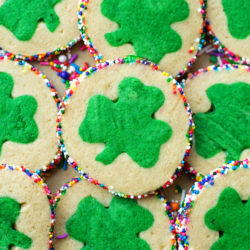 I’ve made a few variations of these cookies over the years, and they’re always a huge hit. 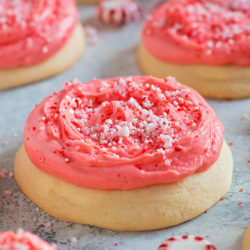 I knew a peppermint version would be well-received both by my family and you guys! To start, you’ll want to make the dough. I prefer using my stand mixer since creaming butter, shortening and sugar in it is a breeze. You can however, use a hand-held mixer and a large mixing bowl. Once the butter and sugar is pale and fluffy, add the egg, egg white and vanilla extract. The extra egg white helps give these cookies their soft, fluffy texture along with my secret ingredient: cake flour. I know what you’re thinking. 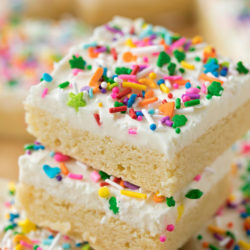 Cake flour in cookies? Is that really necessary? Yes! I’ve tried using 100% all-purpose flour in these cookies and they DO NOT turn out. In today’s recipe I used 2 cups plus 2 tablespoons of Swans Down Cake Flour. Their cake flour is made from the finest soft winter wheat and they only use the best part of the kernel. It’s 27 times finer than all-purpose flour which means it yields fluffier and lighter baked goods. 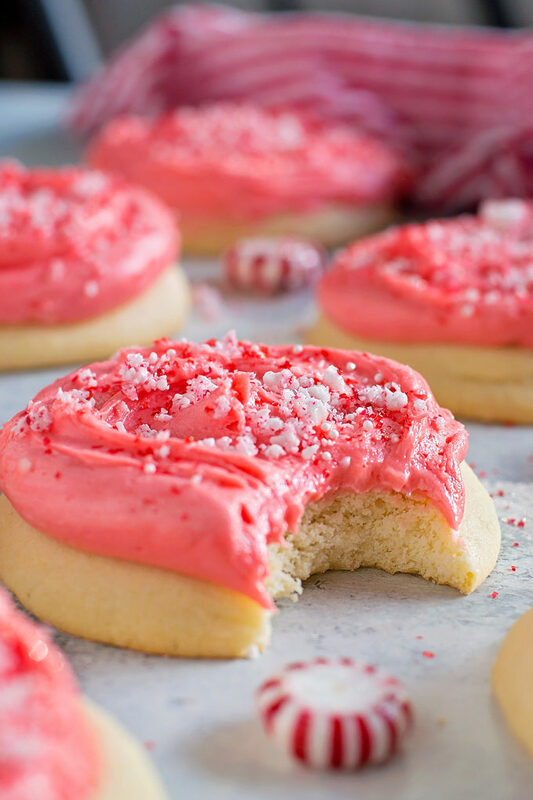 Remember, these are delicate, cake-like sugar cookies, so using a higher ratio of cake flour to all-purpose flour is necessary to get the right texture. 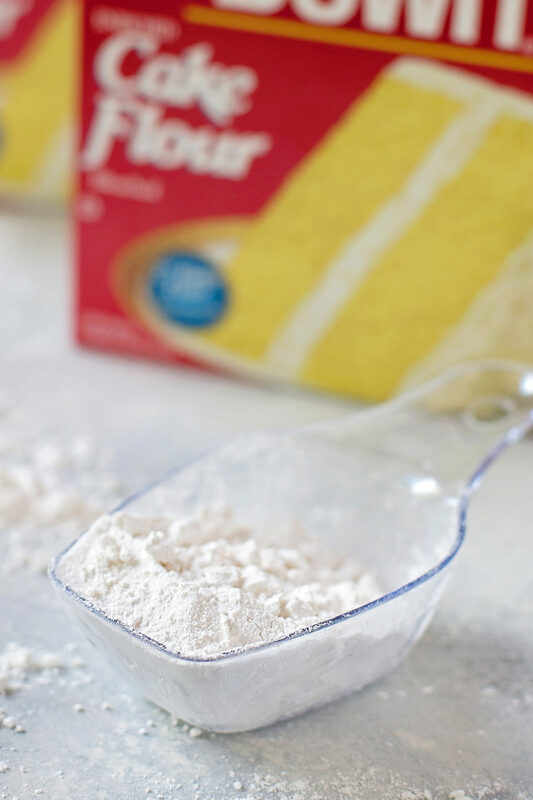 Along with the cake flour, you’ll whisk together a little bit of all-purpose flour, baking powder, cream of tartar, and salt. Mix the dry ingredients with the wet ingredients until a soft, sticky dough forms. Now comes the most difficult part of this recipe- letting the dough chill. Place dough in an air-tight container and refrigerate for at least 3 hours. This will help the dough firm up and will prevent the cookies from spreading during the baking process. It’s an important step, so don’t skip it. At this point, you could also roll the dough into a long log about 2 1/2 inches in diameter, wrap it in plastic wrap and store it in the fridge for up to 5 days or in the freezer for up to 3 months. If you like to plan ahead for the holidays, the freezer option is the way to go! Instead of rolling the dough into balls you can slice it and bake it. Once the dough has chilled, line two baking sheets with parchment paper or a silicone baking mat. Using a large cookie scoop (#20- approximately 3 1/2 tbsp. ), create balls of dough, lightly roll on a floured surface so that it covers the ball of dough completely. 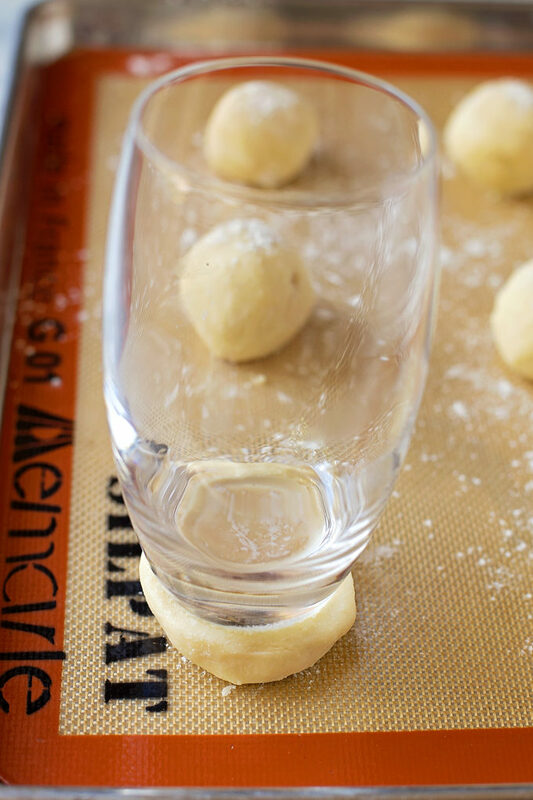 Press each ball of dough flat with the bottom of a glass so that it is 1/2″ thick and about 2 1/2 wide. Place 6 cookies onto each prepared baking sheet. Place in oven at 375 degrees and bake for 9-11 minutes (the cookies will still look soft in the centers, do not over bak or they’ll end up dry and crumbly) or until the cookies become firm on the edges. Remove and allow to cool for 3 minutes before transferring to a wire rack to cool completely. While the cookies are cooling prepare the frosting. 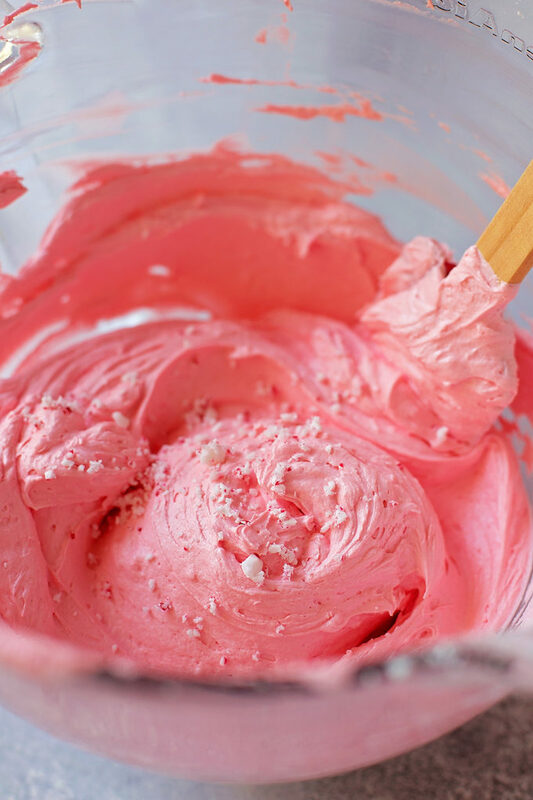 I used a few drops of red food coloring to make it a pretty shade of pink, however, you can leave it out completely. Since the cookies themselves don’t have any peppermint in them, I added 2 generous teaspoons of peppermint extract to the frosting. I really wanted a strong, but not overpowering flavor. 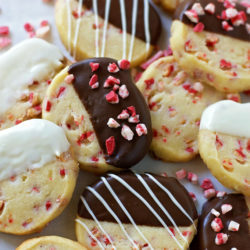 The crushed candy canes on top added a nice little crunch and of course, more peppermint! 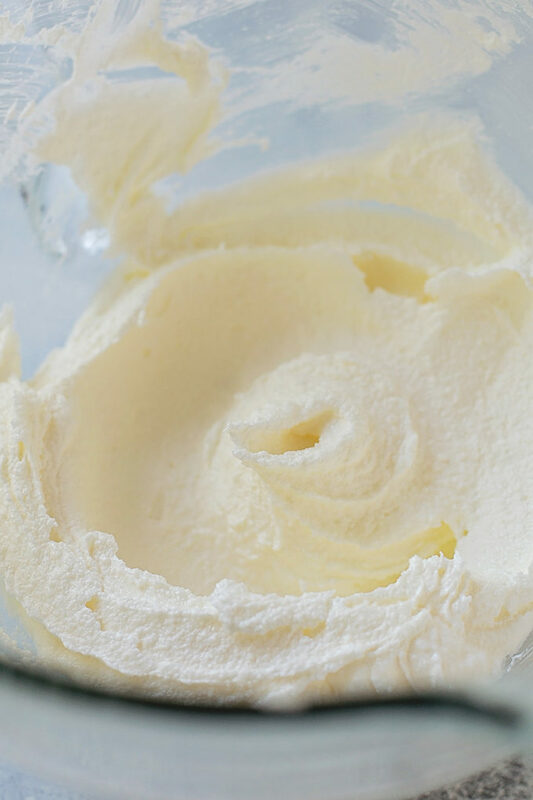 In the bowl of a stand mixer or a large mixing bowl with a hand mixer, cream sugar, butter, and shortening until light and fluffy, about 2 minutes on medium-high. Add egg, egg white and vanilla extract, mix until combined. In a small mixing bowl whisk together cake flour, all-purpose flour, baking powder, cream of tartar and salt. With mixing speed on low, gradually add dry ingredients until no flour pockets remain. Place dough in an air-tight container and refrigerate for at least 3 hours. Preheat oven to 375 degrees. Line two baking sheets with parchment paper or a silicone baking mat, set aside. 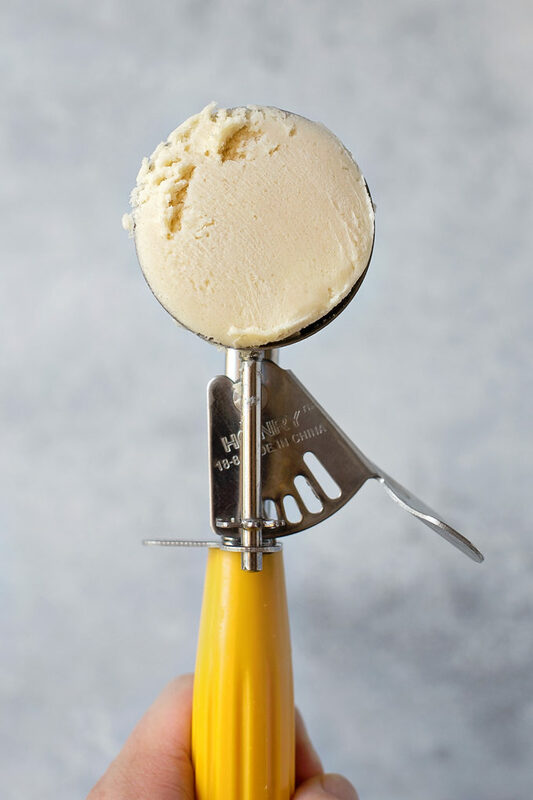 Using a large cookie scoop (#20- approximately 3 1/2 tbsp. ), create balls of dough, lightly roll on a floured surface so that it covers the ball of dough completely. Press each ball of dough flat with the bottom of a glass so that it is 1/2″ thick and about 2 1/2 wide. Place 6 cookies onto each prepared baking sheet. Place in oven and bake for 9-11 minutes (the cookies will still look soft in the centers, do not over bake) or until the cookies become firm on the edges. Remove and allow to cool for 3 minutes before transferring to a wire rack to cool completely. 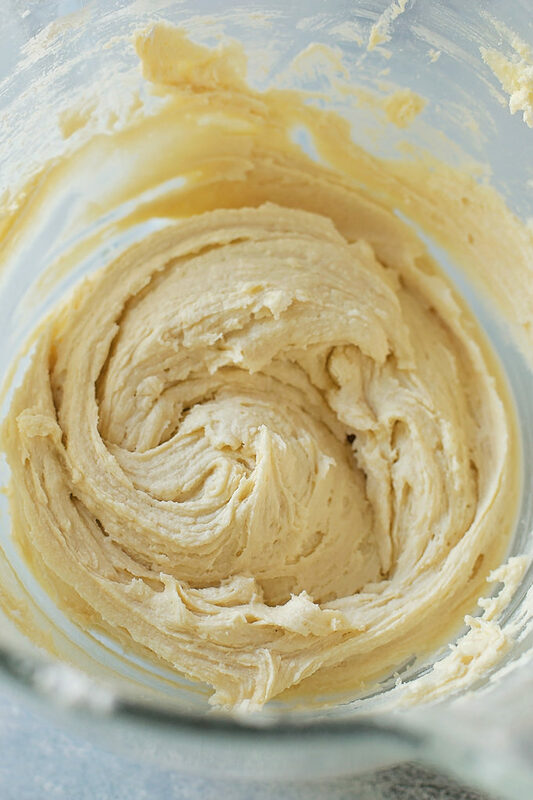 Meanwhile, to make the frosting, in the bowl of a stand mixer fitted with the whisk attachment, or a large mixing bowl with a hand mixer, cream butter until it becomes light and smooth, about 2 minutes. 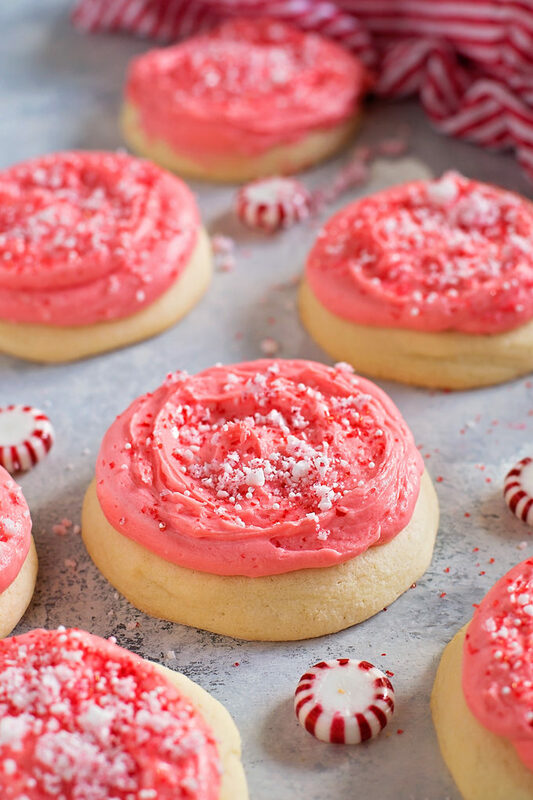 Add peppermint extract, vanilla extract, salt, and food coloring. Beat for 1 minute. With mixing speed on low gradually add the powdered sugar. Once the powdered sugar is incorporated, add milk and bring mixing speed up to high. Beat for 2 minutes. Add more milk to reach the desired consistency. 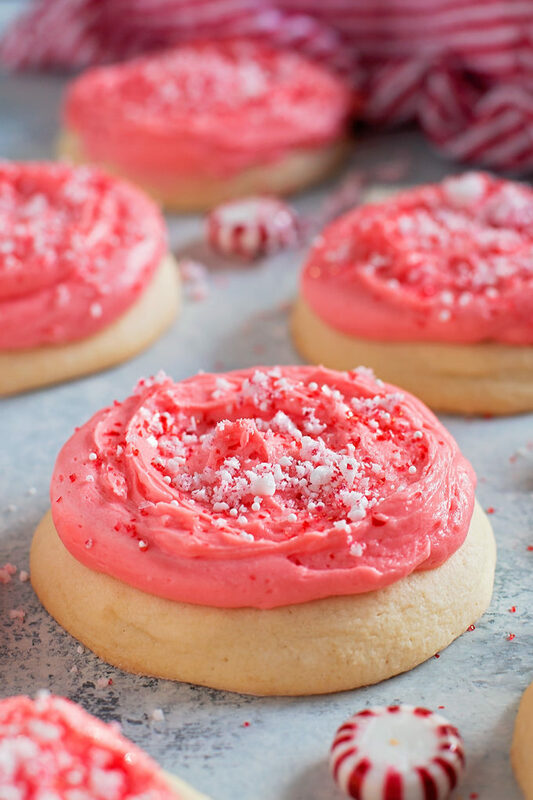 Frost onto cooled cookies and top with desired decorations. For each cup of all purpose flour in a recipe; sift Swans Down Cake Flour once then measure 1 cup plus 2 Tbsp.